This Easter we decided to sweeten things up! Spoil your little bunnies this Easter, with an Easter Breakfast Board for all occasions: sweet or savoury. Super cute and super stylish, the Easter breakfast board (for all occasions: sweet or savoury) has many uses. Use the funky plastic eggs included, to hold fruit, biltong, nuts or any of your little bunnies favorite treats. This will be come your childs favorite mealtime accessory. 1 x White Easter breakfast board for all occasions: sweet or savoury :) easy clean. 1 x Bunny Glass Consol Jar - filled with flapjack mix. Jar to be reused as milk jar when enjoying your flapjacks. 1 x Fun, crazy - animal themed curly straw. 1 x Selection of mini colourful easter biscuits..
3 x Plastic Easter eggs filled with 3 different flapjack toppings. 1 x Large cuddle Easter Bunny plush toy. Limited Stock. Orders close 9th March 2019. T’s & C’s apply – Biscuit & Plastic Easter egg - colours may vary depending on stock. Easter In a BOX This Easter we decided to sweeten things up! 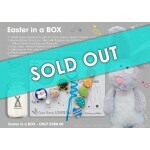 Spoil your little bunnies this Ea..